Right now, we know what’s in Modern Masters 2015. We know what the From the Vault set this summer will be. We know the story lines behind the summer and fall sets. Recent history has taught us anything, it’s that anything not on the reserve list is fair game for reprints. Whether it’s Jace, the Mind Sculptor headlining a FTV, or Mother of Runes in a Duel Deck, the only guarantee we have is that everything will eventually be reprinted. Today, I want to look at some popular casual cards, ones that I feel have a good chance of being printed in the not-too-distant future. These are mostly cards I am willing to trade for now, but I don’t want to keep forever. I think these will get printed again, but I don’t know when. I am not going to try and speculate on what the prices will be, because I don’t know if they’ll be in a Commander deck, a big fall set, a judge foil, or anything. All I know is that these are popular and harder to find than I thought they would be, and might get reprinted soon. This price will probably go down when it gets banned in EDH. It is consistently on the list for cards that people complain about, because it is so incredibly overpowered. If Trade Secrets got banned because two players can work together to draw in credit cards, all it takes is this plus a Clone effect and you get the same outcome. I doubt this will ever be printed in Standard. I suspect that Wizards is collaborating with the EDH Rules Committee, and figuring out whether the Sphinx should get printed again or if it’ll get banned. Elesh Norn is getting her third go-round, but the other four are all backbreaking in different ways. I am actively looking to pick up the others, especially in foil. It will be difficult to print the cycle again, so we would be looking at individual legends printed at semi-random times. Something along the lines of “Jin-Gitaxias in a blue Duel Deck.” I’m not saying it won’t happen, but I’m looking to pick them up now and be safe for at least a year. Aside from Umezawa’s Jitte, these are the consensus first picks in any unpowered Cube. They go into any deck, have a laughably small mana investment, and have iconic art. I do not expect a judge foil printing for the other three Swords. Fire and Ice and Light and Shadow got that treatment because they were so scarce. That said, I wouldn’t be terribly surprised if they did get printed in some way, just to increase the availability. It should also be mentioned that if they haven’t gotten a Tiny Leaders bump yet, they will. It was the GP promo for some time and is one of the ten best Equipment ever. It sees more Legacy play than any other, except perhaps for Jitte. It has a mechanic that overcomes the primary drawback of Equipment. It’s really good! It’s probably not going to be printed again soon, but I would be very wary of it. There are many Cubes out there that still want one, and it’s great in almost every EDH deck, so yeah, I’ll pick them up but I’ll also trade them away without hesitation. This is begging for a reprint. I would not trade for these unless I was building a new Commander deck and I didn’t have one to spare. This is amazing in Commander and nonexistent everywhere else. Swiftfoot Boots is our comparison, as it was trending upwards until being in every Commander product. Adding Plate to this winter’s offering wouldn’t be a surprise at all. Stay away! I’m adding this one because creatures-as-board-wipes is an occasional theme and if you have a few of these as long-term holds, I think you’re going to be disappointed. I wouldn’t be shocked if the relative lack of supply pushed this over $10 in the next twelve months, and I wouldn’t be shocked if it was in a Duel Deck and went down to $2-$3. True Story: When this was in Standard, I traded for these all day and night at $5-$7. It seemed like the most amazing card ever, easier than Chord of Calling and something everyone would want. I was caught holding about ten when the ban hit in Modern, and I dumped them in sadness. They have crept back up into the $8 range, quietly, despite being in FTV: 20. This avoided being in the mono-green Commander deck this last winter, and so I’d feel okay about trading for these. It’s unlikely they will reprint a card too good for Modern, and the Legacy use is there. I’m treating this guy like he’s radioactive. He’s so good at so many things, and he’s due to be reprinted, I feel. He’s a wonderful sideboard option in Modern, a silver bullet to deal with counter/sweeper/removal control decks. I’m not going to be surprised when he’s printed again and I’m not going to be caught holding any. I admit it, I don’t mind trading for Wurmcoils. They just got an infusion of supply in Commander 2014 and that should have them safe from reprints for a while. The card is silly good in any format, and sees light Eternal play in sideboards or some ramp strategies. I am on board for picking this up, as it’ll get back to $20 within a year just from the people who see how universally powerful it is. Skittles here has tripled in price in the past three years, with the most recent increase being because it’s very nice with Scion of the Ur-Dragon. Infect damage gets past infinite life quite nicely, and granting haste and regeneration is quite handy too. This seems primed for a reprint, especially as everything with Infect dodged MM2015’s bullets and will probably show up in the next Duel Deck: Khans vs. New Phyrexia or some such. If you’ve never played with this in Commander or Cube, you’re missing out. It’s value town, and you want to be on this train. It’s got a surprisingly low price given the ability and the fact that he’s a Legendary Zombie. I don’t think it’ll get printed again too soon, but he’s powerful and easy to add to any black deck, making him easier to print. Survival of the Fittest is a reserved list card. (pick it up whenever you can!) Fauna Shaman is a toolbox enabler, a card that makes any Commander list sing. It’s approaching $10 despite being a mere rare, though a rare from 2010. This is a strong candidate to be printed soon, and might even be in Standard again before too long. It bears mentioning that this is an Elf, even if it doesn’t see play in Legacy lists. The wording on this is indicative of how it predates the explosion of EDH. Note the distinction from Chalice of Life’s wording to indicate the same thing…unless your starting life is 25 or 40. Serra Ascendant sees some play in Modern Soul Sisters lists, but it’s really going to shine in Commander. Despite the wording, I think it’ll be printed again and tank pretty badly in price. Keep the few you play and move the rest. If this dodges a reprint in Battle for Zendikar (and its expansion) then it’ll break $20. If it gets printed again this fall, it’ll drop to $5. It’s up to you. When the spoiler hits in fall, this is one of the cards to move on. If there’s new Eldrazi (very likely) then this gets better. It might see a bump in price due to all the Eye of Ugin and Eldrazi Temple that are landing with MM2015. See above, only with less chance of a reprint. This is a silly, crazy ability lending itself to casual formats and not Constructed. I would agree if you wanted to get these now and hope, but having them be in a Commander precon wouldn’t be out of line at all. This is a stay away for me. It’s a mana-doubler and it’s fantastic with Urborg, Tomb of Yawgmoth. It would have been too good, that land and this creature in Standard. Don’t overlook tricks like tapping a Blood Crypt for red mana and adding an extra black. It’ll get printed again and the price will come way down. I always forget this was mythic, too. Mutavault just got finished teaching us how format-defining man lands can be. Granted, that’s possibly the best manland ever, but the extra cost on this cycle makes up for it. I would expect Wizards to do what they did with Elesh Norn and the Praetors, where Colonnade gets printed first and the rest will get there. It’s worth mentioning that Colonnade is by far the priciest despite having been the Buy-a-Box promo. I don’t know if they would do Landfall again, in the return to Zendikar, but if that mechanic is spoiled, you’ll need to get out of these in a hurry. There’s a good chance that it’ll be too good for Standard, especially when Exploit is in play. Thankfully, it won’t be an option to pair this with Satyr Wayfinder, but if Bloodghast isn’t in the Zendikar sets, then it’s still a prime target of reprints. I fully expect this to be in the next Commander product. It’s really great with tokens and patience and kind of terrible in other circumstances. It’s a wonderful casual card and will be printed again before long. Lots wrong with this article, Swords are already seeing Judge versions, we just got Feast and Famine, only matter of time before we see the other two. Spawnsire isn’t a commander card, it doesn’t do anything for it’s main ability, no sideboards and all. You’re right that FaF just got a judge printing. I missed that. I suppose the others will too, but who knows when. As for Spawnsire, if someone landed him in a Commander game I’d say “Sure, grab ’em all!” It’s either a way to use infinite mana to end the game, or someone slogged to 20+ mana the hard way and there needs to be a new game. I really hope avacyn is not in ftv. Also, what about damnation? I have the oppurtunity to buy at 3 for 35 each but im still waiting for more of a spike. I can’t imagine Avacyn not being the headliner for the FTV set. We usually get two big money cards, and with Angels, that means Avacyn and Linvala. If you need the Damnations, buy them now. If you are scared of the eventual reprint, wait. The consensus seems to be that it will happen, but when? Who knows. It probably won’t be in a Standard-legal set. Four mana Wraths are too good. Damnation is already annouced as the next Judge foil, should be out in a month or so. Although that probably wont affect the prices of normal version much. Given the history of ftv sets, I was under the impression that money cards in general were from older sets. Avacyn restored is still relatively new So I was banking on it being safe or a coin toss between linvala and her. I dont know why they would do both. Also theres emeria and entreat too along with other mythics they could do. Which see more eternal play Than the casual angel. I wouldn’t expect any new Eldrazi to have Annihilator. Most of these posts line up with when Design/ Development would have been working on this years fall set. MM2 is probably the last we will see of the annihilator ability for some time. 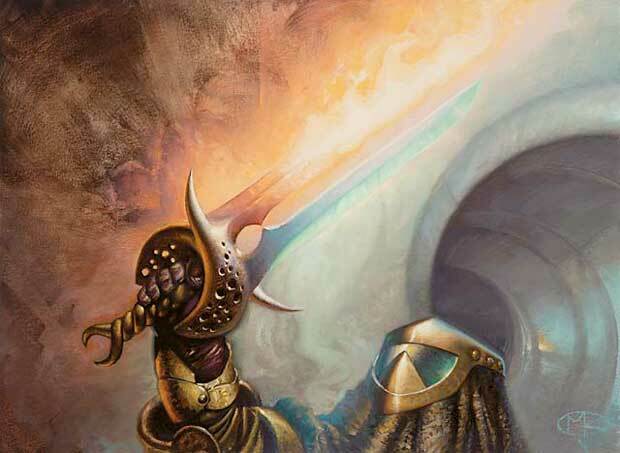 Wishful thinking, but I want there to be a FTV: Equipment/Artifacts product that reprints all the swords and relevant “universal” artifacts that can be thrown into almost any deck. Would be cool to see new artwork for foils as well. I look at widespread demand when judging reprint targets rather than just price. Everyone should have a some swords and cool equipment/artifacts in their collection and judge foils just don’t fill that demand. I think a FTV: Equipment/Artifacts should be coming down the line sometime after Angels. Again, this may be wishful thinking… But it makes sense to me.